Abode Srl. Our official blog. Everything Italian and more. Italian Real Estate is our business. : Italy is being invaded! Apparently Italy is being invaded by trees. An invasion that may be hard to believe when the annoying buzz of chainsaws is a frequent sound on most days. A report has revealed that abandoned farmland, especially in mountainous areas in the south, has led to massive (yes massive) re-afforestation. 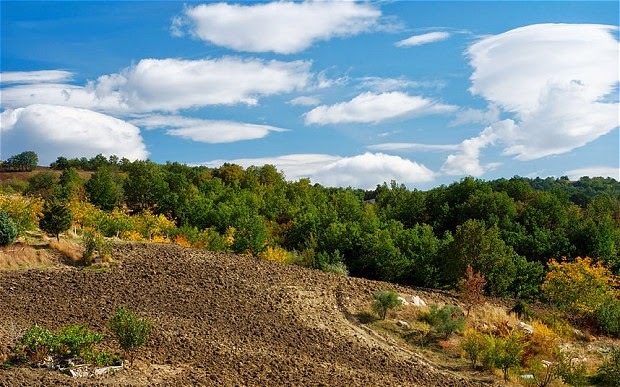 Italy now has more forest and woodland than ever before with 35% of the country being covered. There are now 27% million acres of forested land which is more than double the amount that there was at the end of the second world war. Tourists in the green heart of Italy are used to seeing hillsides swathed in green but now even the dryer southern areas of Molise, Sicily and Calabria have seen woodland increases of 17, 11 and 10% respectively. The increased cover is helping to absorb large amounts of carbon dioxide and is also providing homes for larger wild animals like lynx, deer, wild boar, brown bears and wolves. In the last ten years the numbers of wild boar roaming the woody hillsides have increased from 600,000 to 1 million and the population of Roe deer from 10,000 to an estimated half a million. Britain has comparatively little forest cover; only 12% whilst Ireland, surprisingly, has less than 10%.